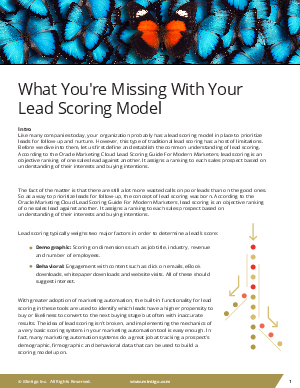 Lead scoring models were put in place to prioritize leads for follow-up, nurture and marketing investment. However, with guesswork and data coming from disparate sources, traditional lead scoring has a host of limitations. In today’s competitive landscape, organizations needs to embrace more advanced and reliable scoring models to succeed. Read this ebook to learn 4 reasons why traditional lead scoring is not adequate, and why scoring with AI is necessary.